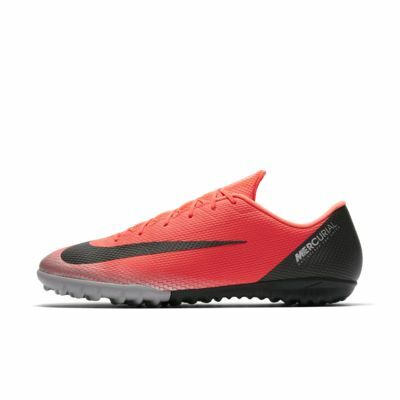 The Nike MercurialX Vapor XII Academy CR7 Turf Football Shoe provides exceptional ball touch and a comfortable, secure fit that promotes acceleration and quick directional changes on the pitch. Cristiano Ronaldo has dominated the world&apos;s biggest stages since he began his professional career. With multiple Player of the Year honours to his name, he&apos;s gone from prodigy to all-time great in only a decade. His winning mentality, explosive speed and uncanny goal-scoring ability have made him a prolific winner and record-setter at every level. Have your say. Be the first to review the Nike MercurialX Vapor XII Academy CR7 TF.